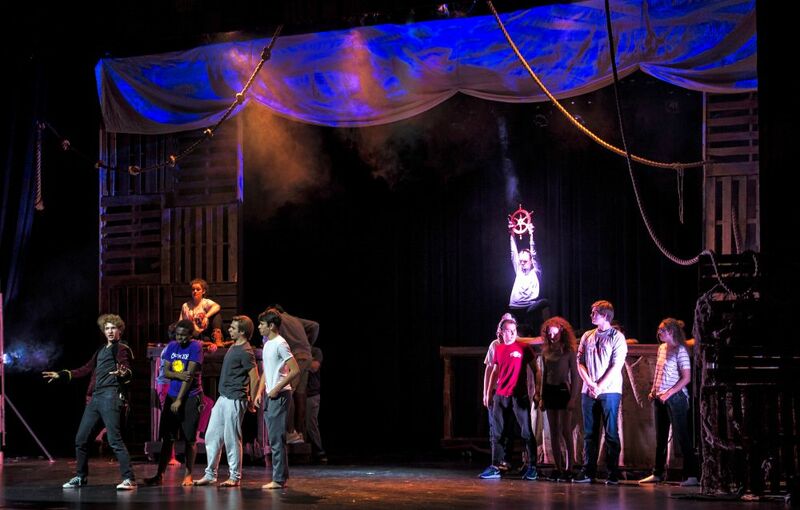 When production rights to the award-winning Broadway play “Peter and The Starcatcher” came out earlier this year, two area drama teachers were chomping at the bit to produce it. 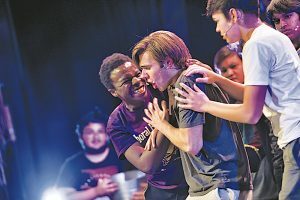 Instead of worrying about stepping on each other’s toes, Rock Ridge High School’s Anthony Cimino-Johnson and Loudoun Valley High School’s Russ Staggs decided to try something novel—working together to put on parallel productions at both schools. The collaboration has been a creative boon for the directors, actors and crew, and has turned an old rivalry into a new cross-county community. Rock Ridge and Loudoun Valley, located in Ashburn and Purcellville respectively, will present separate productions Dec. 1-10. The schools have been drama rivals since Rock Ridge opened in 2014, with LVHS taking the prestigious Virginia Theatre Association’s High School Theatre Festival title that year and RRHS claiming the prize in 2015. But that rivalry has been replaced with a sense of mutual support. The comedy is a prequel to the classic “Peter Pan,” based on a 2006 novel by humorist Dave Barry and suspense writer Ridley Pearson. It offers a 21st Century take on the back story of the nameless orphan who eventually becomes Peter Pan. The play also spotlights the characters of Molly, a young girl charged with protecting a treasure chest full of magic “starstuff” material, and Black Stache, the pirate chief who goes onto become Captain Hook. The idea of parallel productions took form this summer when Staggs and Cimino-Johnson headed up the theater program at the PAVAN arts governor’s school this summer. Both directors knew they wanted to put on the show, but Staggs was initially hesitant because of a longstanding high school theater tradition of not running the same production as another local school. Cimino-Johnson encouraged him to go for it, and the two decided to collaborate, sharing marketing ideas (including cross promotion on social media) and directing expertise and putting on joint workshops for student cast and crew members. For Staggs, the show is a way to celebrate a core group of seniors who came in as freshmen during his first year at Valley in 2013. One of those seniors is Charlie Trochlil, who plays Black Stache and is embracing the character’s hilarious wickedness. For LVHS set designer Noah Wade, connecting with his Rock Ridge counterpart and “doppelganger” Noam Denenberg was a blast. The two had never met or discussed their visions but were blown away by eerie similarities in their ideas. They have continued to share ideas and developments in the weeks leading up to the shows. “It was very humorous for him and me to sit down and pull out our sketchbooks and see almost completely mimicked designs,” Wade said. Despite big differences in the two schools’ history and demographics (Loudoun Valley, the county’s second oldest high school, opened in 1962, while Rock Ridge is the second youngest and has a more diverse student body), the directors were impressed with the commonalities that emerged. “There was just such synchronicity in the way that Russ had cast certain roles, in choosing our designers, in the way things were designed—it was really quite cool to see that happening and to see what had been a rivalry turn into a camaraderie,” Cimino-Johnson said. 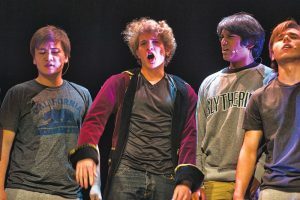 The cast and crew at both schools will be able to catch a performance at the other, and that will also be an important part of the experience, Loudoun Valley’s Trochlil said. 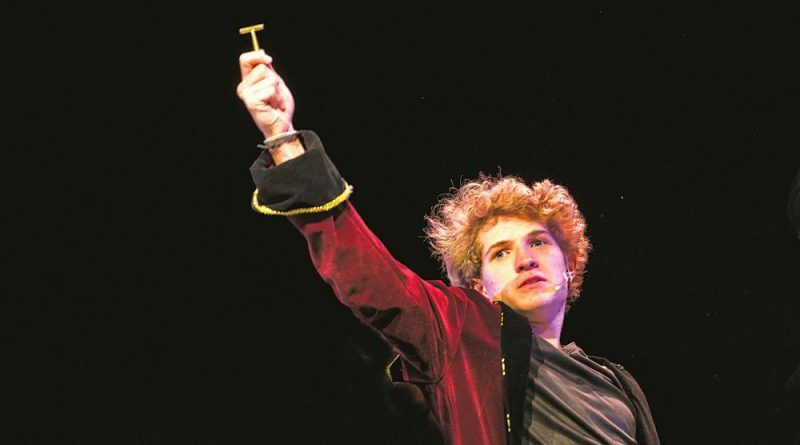 “Peter and The Starcatcher” runs Thursday, Dec. 1-Saturday, Dec. 3 and Thursday, Dec. 8-Saturday, Dec. 10 at 7 p.m. with a matinee Saturday, Dec. 3 at 2 p.m. at Loudoun Valley High School in Purcellville. Tickets are $10. For more information, go to lvtheatre.org. At Rock Ridge High School, the production runs Thursday, Dec. 1-Saturday, Dec. 3 at 7 p.m. and Friday, Dec. 9 and Saturday, Dec. 10 at 7 p.m., with matinees Saturday, Dec. 3 and Sunday, Dec. 4 at 2 p.m. Tickets are $10 in advance, $12 at the door. For more information, go to rockridgedrama.org.